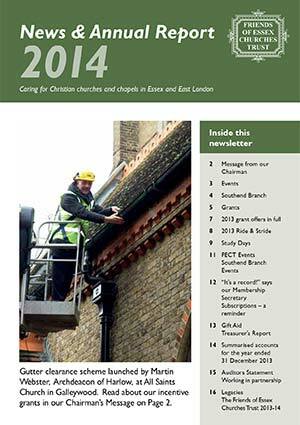 We exist to enhance the amazing legacy of Essex and East London church buildings. 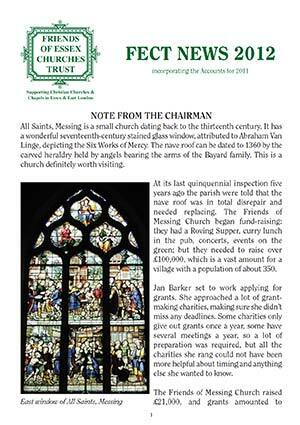 The grants we award transform the church buildings of the past into places of worship our communities want to use today and tomorrow. This is thanks to the generous support of our volunteers, members and donors for which we are grateful. 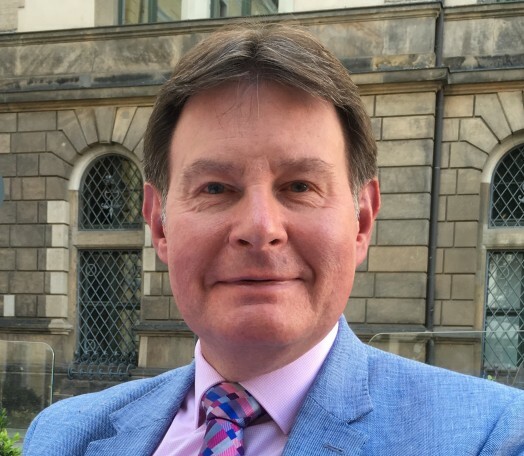 Jeremy joined the Trust’s executive committee in 2014 and was elected Chairman in 2017. He worked as a publisher and lived in London for 30 years before returning to the rural, mid Essex parish that he was born in. 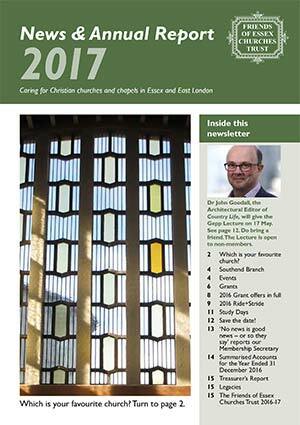 He has been a churchwarden in a London parish and is now a churchwarden in his home village of High Easter. H. Martin Stuchfield, M.B.E., J.P., D.L., F.S.A., F.R.Hist.S. 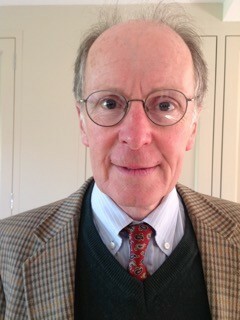 Martin is a trustee of numerous registered charities concerned with heritage, history and archaeology. 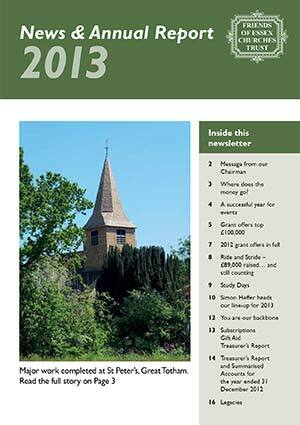 Martin is President and Conservation Officer of the Monumental Brass Society. 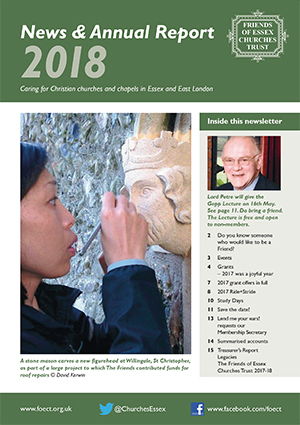 He is also a consultant on monumental brasses to the Chelmsford, Norwich and St. Edmundsbury & Ipswich Diocesan Advisory Committees (‘D.A.C.’). He is a Trustee and Director of the Rural Community Council of Essex and the Stow Maries Great War Aerodrome. 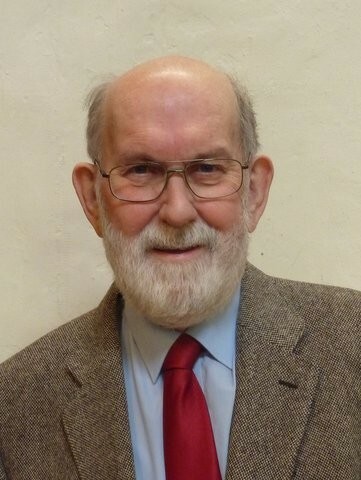 He is also a Vice-President of the Essex Society for Archaeology and History and a former Chairman of the Victoria County History of Essex Trust. He is a Fellow of the Society of Antiquaries of London and a Fellow of the Royal Historical Society. He was appointed a Member of the Most Excellent Order of the British Empire for services to Heritage, Charity and the Community in Essex. 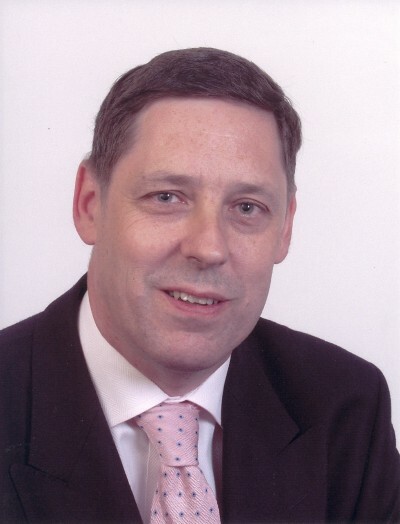 He is also a Deputy Lieutenant for the County of Essex and a member of the Court of the University of Essex. 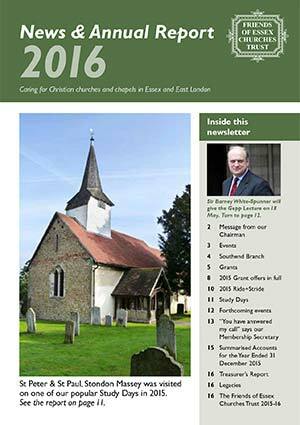 Martin is Churchwarden of the small Essex church dedicated to St. Gregory and St. George at Pentlow. Harry was elected Hon. Treasurer in 2014 having been a P.C.C. Treasurer in Chester, Lincoln and in the Diocese of Chelmsford almost continuously since the age of twenty-five. He was a member of both Bishop’s Council and Finance Committee in each of the three dioceses and also of General Synod for sixteen years until 2010. He spent 40 years as a Tax Inspector on Merseyside (including Charity Division in Bootle), in Lincolnshire and in London, reaching Senior Principal level. Harry, and his wife Margaret, came to live in Great Baddow in 1988 following a transfer to London principally to deal with UK shipping. He was appointed Hon. Canon of Chelmsford Cathedral in 2004 and has recently been named as a nominee to receive Maundy Money from the Queen in March 2018. Rachel is current Chairman of the Events Committee, she leads a dedicated group of enthusiastic and capable fundraisers. Having grown up in a rural parish, she understands the value of the parish church in bringing the community together to worship, and to provide a focus for many other projects and activities. Rachel appreciates the enormous demands the parish church can impose upon often dwindling congregations, in terms of maintenance and repair, and feels that additional help, by way of the Friends of Essex Churches Trust is essential if we are to preserve our beautiful and historic buildings for future generations to enjoy, value and use. Rachel is a nurse by background, is married to a now retired doctor and has three grown up daughters. She joined the Events Committee in 2010, and organised the Gift Fair for five years, before becoming Chairman. "The church spire or tower points to the sky as a lasting symbol of hope. The fabric of the church is beautiful. Inside the church are treasures of craftsmanship. The church tells the story of the place which has grown up around it. 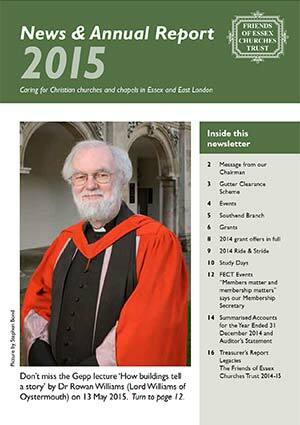 Each unfolding chapter in the life and faith of the community is written in the church." A Londoner by birth, Ralph describes himself as a naturalised Essex Man. In his day job he is the Communications Director of Chelmsford Diocese, the Church of England in Essex and East London. 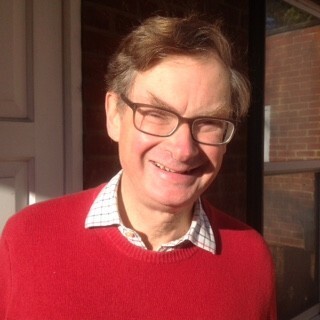 John has lived in Saffron Walden since 2012 and has a longstanding interest in East Anglian churches. A Cambridge graduate, he worked in the City with investment banks, including, most recently, HSBC. 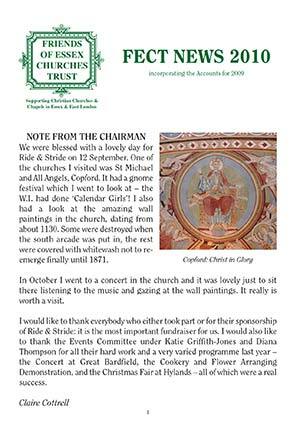 Following his late father-in-law, Thomas Gepp, he became involved with the Friends of Essex Churches Trust in 2014, and has taken over the responsibility for the annual Ride & Stride, which takes place on the second Saturday of September. 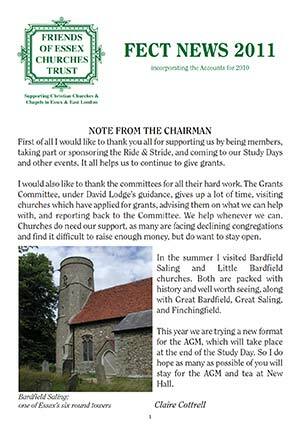 In addition to being a significant fund-raiser, this event provides an excellent opportunity each year for Essex churches to open their doors to visitors, and for Riders and Striders to appreciate how fortunate the county is to have such a remarkable wealth of fascinating buildings.